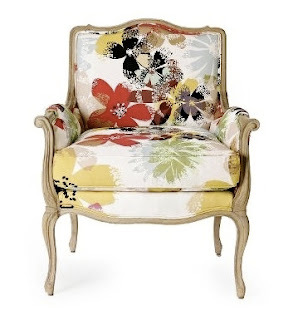 What do you think: could this French Hawaiian Hibiscus chair encapsulate the look of the new White House? Domino blogger Nick Olsen thinks it marries the traditional sophistication befitting the new First Family with the tropical flavour of their favourite vacation destination. Here’s a radically different intepretation: a sophisticated but fun modernist look for the Oval Office by Jonathan Adler at InStyle.com. 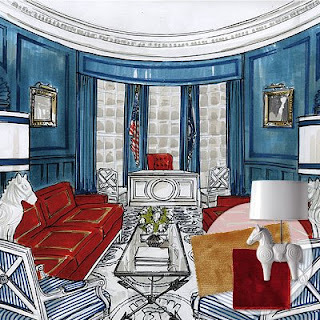 Adler has used tone-on-tone walls and drapery, his signature Montmartre table and Horse lamps, and a repeat pattern of the presidential seal on the rug. 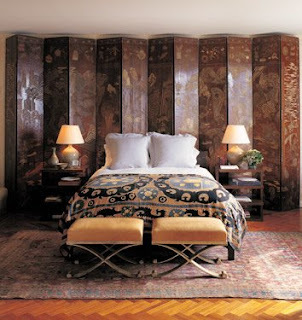 She’s envisioned Jasper Johnsâ€™s Gray Flag (1957) above the mantel, large sofas and armchairs in neutral shades, and lots of textures like parchment leather and natural linen. 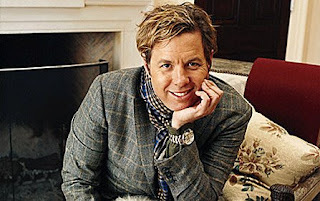 According to Domino magazine, none other than Los Angeles interior designer Michael Smith (above) has been selected as the Obamas’ designer-in-residence. “The family’s casual style, their interest in featuring 20th century American artists and utilizing affordable brands and products will serve as our guiding principles as we make the residence feel like their home,” Smith says on Domino’s website. 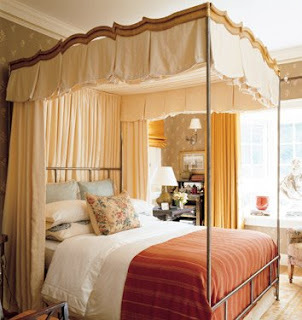 Smith’s trademark style definitely veers towards plush tradition, as you can see in the above photos of other rooms he has decorated, but he creates a feeling of casual comfort by varying subtle shades of colour and mixing different textures and patterns. 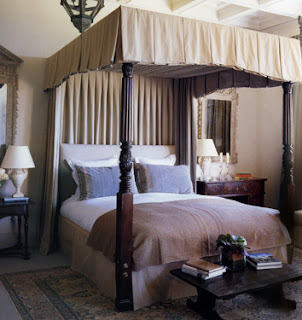 In this video tour you can take a sneak peek at his house, which is grand and homey at the same time. 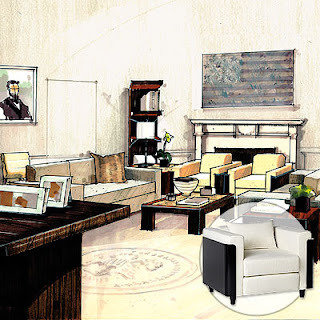 Domino has many other fun features on its site: a room-by-room historical tour of the White House, cast your vote on which administration did it best, and a very amusing and informative First Lady Decorating Smackdown between Nancy Reagan and Jackie Kennedy by Nick Olsen. In the meantime, we’ll have to wait to see just how the Obama family manages to put their stamp on America’s most famous house.